Published: Mon Mar 19, 2018 | by Julian Knight Reading time ~1 min. The Flows website is the best place to go in order to find contributed nodes for Node-RED. It also contains example flows showing how to do various tasks. 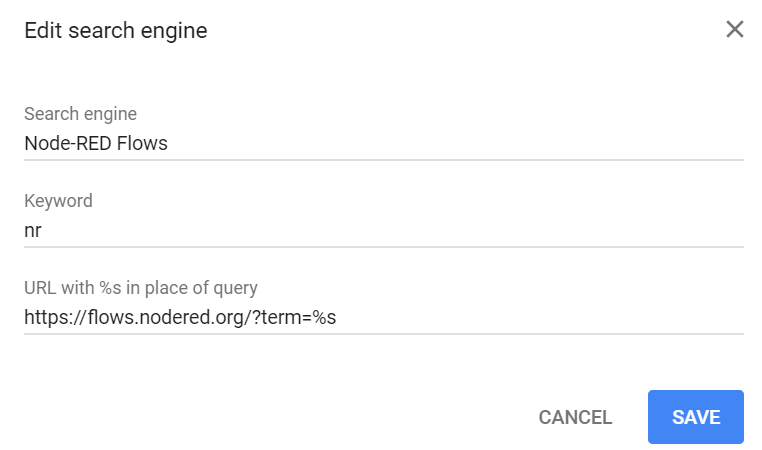 You can search on that site by node name, author name and tags and the results are paged. You can also use the URL to search and this means that you can add Flows as a custom search engine in your browser. Or even from Node-RED itself! Select “Settings” from the menu. Scroll down to the “Search engine” section and click on “Manage serach engines”.